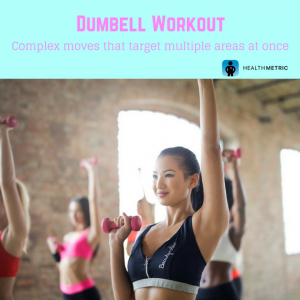 Focus on complex moves that target several areas of your body at once! This dumbbell routine from Health Magazine uses 3, 5, and 10 lb weights. Do up to four rounds of each move. Y, T, and A reverse fly- 10 reps. For this move, hinge forward at the hips. Lift your dumbbells in front of you for ‘Y’. Return to your start position, and lift the dumbbells out to your sides for ‘T’. Return to the start position and lift dumbbells behind you for ‘A’. Single leg tricep triangles- 10 reps on each side. Lift one foot slightly off the floor, and draw a triangle shape with your weights. Are You Checking Omega-6 in Food?